Recently, TJ Walker interviewed me. We spoke about many things: how I evolved and got to do what I do, what are my thoughts on presenting, and so much more. The transcript below covers only the first five minutes, but the recorded podcast that you can play spans more than an hour. 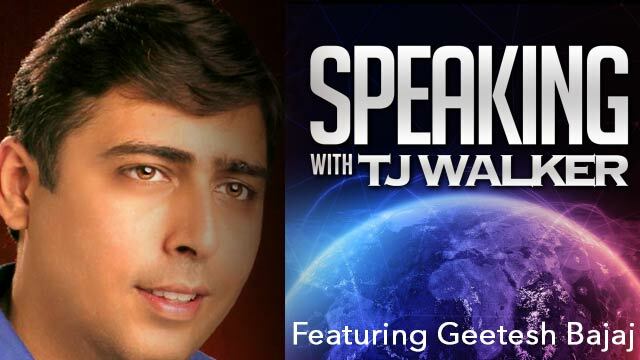 TJ: Our special guest today is internationally renowned PowerPoint expert, Geetesh Bajaj. He is the founder of Indezine, one of the most well-known websites and newsletters read by millions each month on all aspects of the technology of PowerPoint. In this show, you’re going to learn some real insights. I know I learned a lot, like what is the foolproof way of actually starting a content website and making money. It’s very different from a lot of strategies you typically hear. He goes into exactly how he uses technology when creating PowerPoint presentations, and has some interesting frames—ways of looking at this. He says you should look at a PowerPoint slide, the same way you look out a window, in your own home—a fascinating perspective. And he has insights that you may have heard before but he just says it in an intriguing memorable way; just simple tips like when you’re giving a PowerPoint presentation, “Don’t impress. Inform!” It sounds simple and yet most people don’t do it. Now, he’s a guy who has published half a dozen books, speaks, and trains all over the world, has millions of readers, viewers, consumers of his content, and he does it all from Hyderabad, India—a fascinating personal story of how he rose from a family business making food products. In India, at a time when it was hard to even get a landline to now becoming a true technology and communications leader around the world. Please settle back and get ready for a great interview. Geetesh, thanks for being our guest today. Geetesh: It’s wonderful being here today, TJ. TJ: A lot of our listeners are familiar with your name and who you are because you’ve done short, sort of guests appearances here. Before we talk about your specific niche, issues like PowerPoint…Today is a little different. We want to really go deep, find out more about who you are, and how did a guy who lives on the other side of the world—you now live in Hyderabad, India… become so influential throughout the world, and especially in the United States when it comes to PowerPoint presentations. As noted in the introduction, you are a Microsoft MVP, a Most Valuable Professional with respect to PowerPoint. You’ve written half a dozen books on communication and PowerPoint. 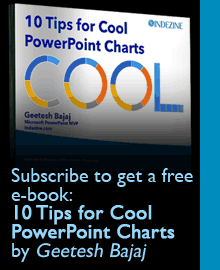 Your Cutting-Edge PowerPoint for Dummies is still an extremely popular book, and hundreds of thousands of people are reading your newsletter every single week, and going to your Indezine site. Where did this all start? Geetesh: I never planned this, TJ. And it just happened. One thing led to the other. I was fascinated by what I was doing, I was passionate about what I was doing, and that’s how I got here. It’s a journey, and I’m on the journey now. TJ: Now what were you doing in, say high school or college, because I remember ten years ago, when I was in Bangalore, working with executives at Infosys, they were telling me that you know ten years earlier, they had to wait eighteen months just to place an order for a phone line; forget the Internet or high-speed access—and it was another eighteen months before the phone line got put in… so, what was your life like growing up in a relatively small town in India? Geetesh: Not really a small town. Even in those days, Hyderabad was the sixth largest city in India, and Indian cities are huge. So it was probably not as well known outside India. TJ: And then there goes my there goes my American bias, ignorance… If I haven’t heard of it, it must be a small town.